I decided the peppers looked banana-ish enough to be harvested. There were four peppers on the plant. They turn this golden yellow color when they are ripe. 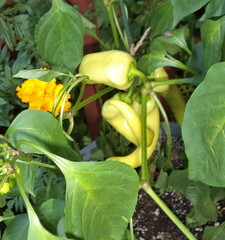 The plant is still loaded with blossoms and with the green globes of new peppers. If they all mature, I'll have more than I can eat. The lilac pepper hasn't set blooms yet. It must take longer to mature. I do have to keep these watered. With the heat and humidity that has descended upon the Chicagoland area, the plants quickly dry out in the summer sun. They get sun from around 11 to around 3, which includes the hottest part of the day. While peppers love hot weather, in pots they dry out and start to droop. That's not good. I've come home this week to find rather sad looking flowers on the deck. They perk right up once given a good long drink. So here's my first pepper harvest.